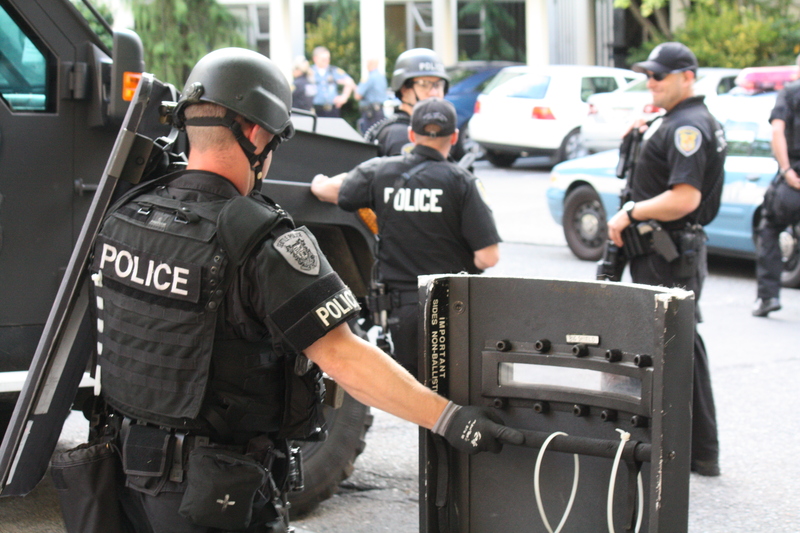 SPD and SWAT units responded to the Talisman building at Terry and Union Sunday night after a report that a suspect in an earlier incident may be inside and armed. Police at the scene could not tell us what lead to the raid but did say they were taking precautions that an armed suspect may be inside. Negotiators were called to the scene around 5:30p. Man surrenders peacefully to SWAT team officers after stand-off. It all started July 22nd at approximately 2:30 p.m. when Washington State Convention Center security called 911 to have an intoxicated male removed from the premises. 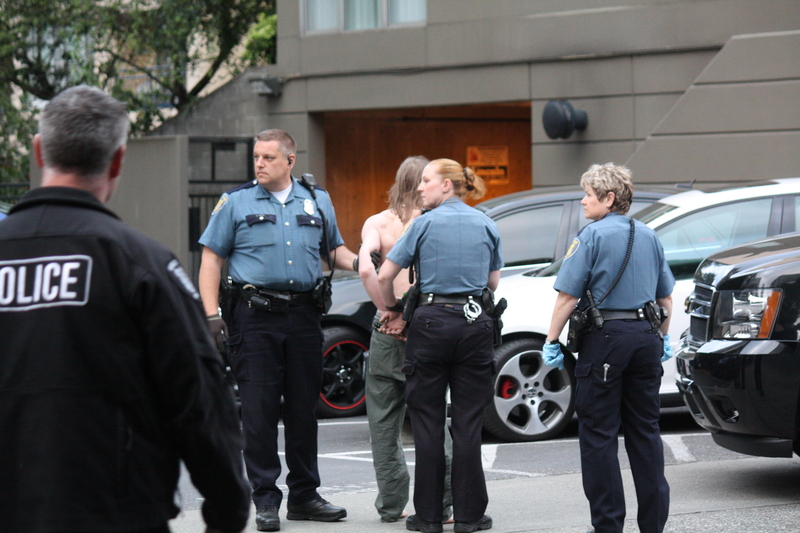 Patrol officers responded and found the suspect, a male in his 40′s, so intoxicated that after removing him from the convention center they drove him home to his apartment in the 1000 block of Union Street. At approximately 3:56 p.m. officers responded to the same suspect’s apartment in the 1000 block of Union Street for the report of a single gunshot fired inside the apartment. The suspect’s girlfriend had exited the apartment shortly after the gunshot was fired (uninjured) and spoke with the investigating officers. She didn’t know why the suspect discharged the weapon, but indicated that it was not directed at her. The suspect refused to answer the door for officers. 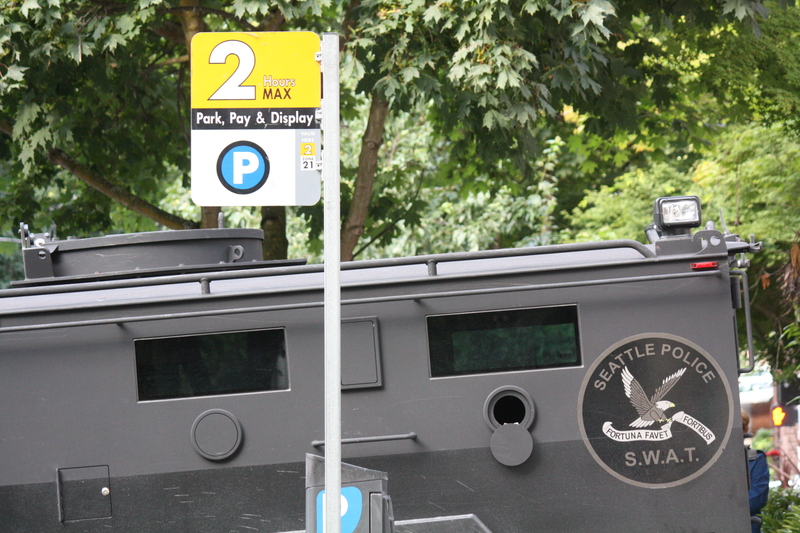 The SWAT team responded to the scene and made numerous attempts to get the suspect to come outside. At approximately 8:00 p.m. SWAT officers effected entry into the suspect’s apartment and placed the suspect under arrest. Officers recovered the gun that was believed to be used by the suspect. Thankfully, nobody was injured in the incident. This entry was posted in Uncategorized and tagged convention center by jseattle. Bookmark the permalink. Approximately 10 minutes ago, there was a gunshot from an apartment above me and I saw a bright flash. It’s hard to say what is happening moment to moment because we are essentially on lockdown as a safety precaution. I am speculating but it is common for police to throw a flashbang into a house they think someone might be passed out in (drunk, overdose, suicide) to get them to respond. They are also used before raiding a residence but I think posters would know if that happened. That was likely the flash bomb you heard. Ive heard nothing about additional shots fired. Stay safe. I live in the high-rise next door. There are still a half-dozen SWAT team members and a few uniformed police officers waiting around, but they look relaxed and are having conversations with curious pedestrians. There’s an ambulance waiting nearby. We heard the loud boom at Minor & Union. Hope everyone is safe and the situation is resolved soon. 7:46 pm update, a couple of the SWAT guys put on helmets and pulled really big guns out of the van. Then grabbed a 6-pack of bottled water and head into the building. 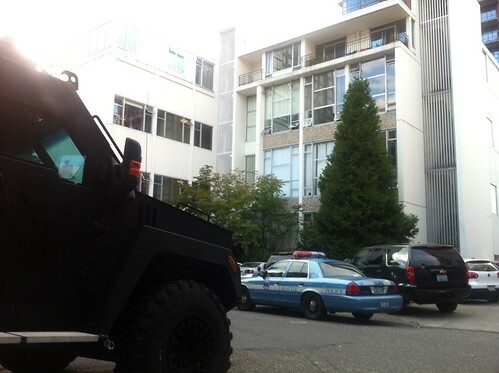 I have pictures, and if I knew anything about guns or SWAT procedures I might actually have a clue what were happening. We heard the noise, too. We’re in the apartment building next door to the Talisman. So glad I found this, it’s the only mention of the situation I’ve been able to find. Nice to know what’s going on. 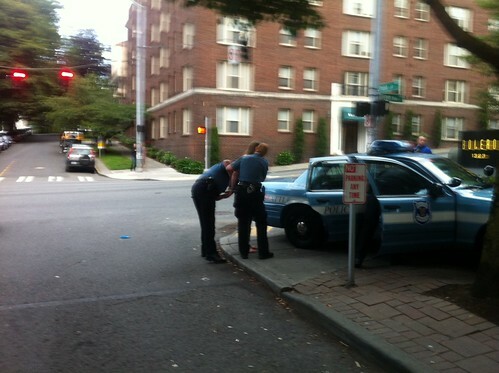 The police just walked a man out in handcuffs, with reporters taking pictures. I’m sure they have to search and secure the apartment, but I’d say it is over. I live in the Bolero across Union. Please update if any additional information becomes available. Just found out that the guy who was arrested is my brother’s tenant. I’m glad no one got hurt. This might be a good time to point out that sometimes (often) the police get it right. This reality seems to be conveniently ignored by some of the anti-police posters on this board. I live 1/2 block from this place, heard a single loud *BANG* go off yesterday, assumed it was someone lighting off a leftover M80. Seems all was handled well, just wish they would’ve told me they were going to discharge a flash-bomb. Definition: A device that makes a huge boom (or noise). Lets all help to keep the peace!